There were a few human casualties in last night's episode of Game of Thrones, and a few non-human casualties as well, one of which could change the face of this Great War in the Game of Thrones Season 7 finale and the final season, debuting either next year or perhaps in 2019. 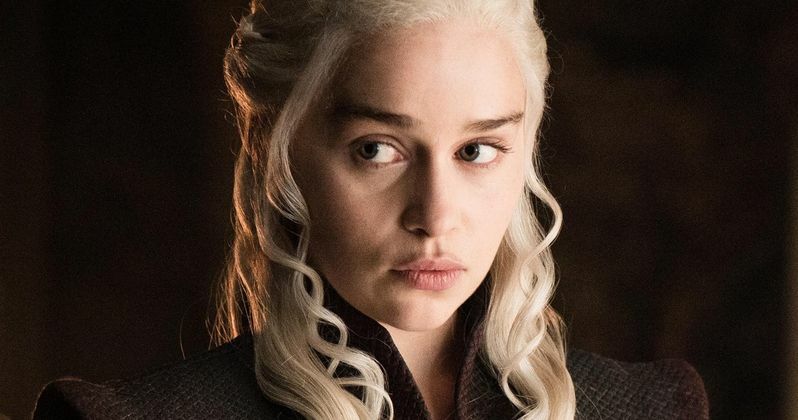 Daenerys Targaryen herself, Emilia Clarke, recently spoke about one of these devastating losses in a new interview, but if you haven't seen this episode quite yet, there will be SPOILERS below, so read on at your own risk. The actress revealed that this loss is quite "heartbreaking," but this is your last chance to avoid any SPOILERS, so if you haven't watched last night's episode yet, stop reading right now. During last night's episode, Jon Snow (Kit Harington), Beric Dondarrion (Richard Dormer), Thoros of Myr (Paul Kaye), Gendry (Joe Dempsie), Sandor "The Hound" Clegane (Rory McCann) and Tormund Giantsbane (Kristofer Hivju) set off on a journey north of The Wall, to find a White Walker they can capture and take back to prove these undead creatures do in fact exist. Their plan hit quite a big setback when they found themselves trapped on the frozen ice and surrounded by the White Walkers and their leader, the Night King. Jon Snow sent Gendry to run back to The Wall, to send out a raven to Daenerys Targaryen, to come save them with her dragons. While she ignores Tyrion Lannister's (Peter Dinklage) request to "do nothing," she ends up saving most of their party (minus Thoros of Myr, who died just before Daenerys' arrival), Dany also lost one of her dragons, Viserion, who was taken down by a spear throw from the Night King himself, and at the end of the episode, the White Walkers were able to pull the dragon from the icy lake, with the episode ending with the Night King bringing this dragon back to life. Entertainment Weekly caught up with Emilia Clarke, who revealed this loss is heartbreaking to Dany. "It's a heartbreak. Not only losing it but having that being given to the other side. My dragon could not have died for nothing, so this is now so important. For the first time, you're starting to see her defenses broken." At the end of the episode, when Jon Snow finally made it back to Eastwatch, Daenerys pledged that she would help Jon Snow beat the Night King and his army, before Snow pledged to "bend the knee" to Dany, which could be quite interesting when Jon gets back to Winterfell. As for her dragon Viserion, the actress joked that, of course, the dragon who she named after her nefarious brother Viserys (Harry Lloyd), would be the one that that ultimately gets turned and used against her. The actress also teased that the patience we have seen from Dany is now gone. "The biggest question this season for Dany is what side of the coin she's on. The unequivocal nature in choosing to be this aggressive is something you haven't seen before. She's practiced patience and has this savior-like quality, but now it's game on." The Game of Thrones Season 7 finale trailer teased the fateful meeting between Jon Snow and Queen Cersei Lannister, where Jon tries to convince Cersei that the only war truly worth fighting is between everyone in Westeros and the army of the dead commanded by the Night king. While we don't see it in the trailer, we know that Sandor Clegane (Rory McCann) will be making the trip to King's Landing, which could result in the long-awaited "Cleganebowl," pitting The Hound against his brother, The Mountain (Hafthor Julius Bjornsson), but it isn't ultimately clear if this battle will happen quite yet. Hopefully we'll learn more about the Game of Thrones Season 7 finale between now and its Sunday, August 27 airdate.